Diabetes mellitus (DM) and impaired glucose tolerance (IGT) are risk factors for acute myocardial infarction (AMI). However, it is unknown whether hyperglycemic state is associated with increased major adverse cardiovascular events (MACE) after AMI. In this study, we evaluated the relationship between glucometabolic status and MACE in patients after AMI, and determined the critical level of 2 h post-load plasma glucose that may be used to predict MACE. AMI patients (n = 422) were divided into 4 groups as follows: normal glucose tolerance (NGT) group, IGT group, newly diagnosed DM (NDM) group, and previously known DM (PDM) group. MACE of the 4 groups were compared for 2 years from AMI onset. The NDM group had a significantly higher event rate than the IGT and NGT groups and had a similar event rate curve to PDM group. The logistic models analyses revealed that 2 h post-load plasma glucose values of ≥160 mg/dL was the only independent predictor of long-term MACE after AMI (p = 0.028, OR: 1.85, 95% CI: 1.07-3.21). The 2-year cardiac event rate of patients with a 2 h post-load hyperglycemia of ≥160 mg/dL was significantly higher than that of patients with 2 h post-load glucose of <160 mg/dL (32.2% vs. 19.8%, p < 0.05) and was similar to that of PDM group (37.4%, p = 0.513). NDM increases the risk of MACE after AMI as does PDM. Particularly, post-AMI patients with a 2 h post-load hyperglycemia ≥160 mg/dL may need adjunctive therapy after AMI. It is well known that diabetes mellitus (DM) is an independent risk factor for cardiovascular disease (CVD). The risk of CVD for diabetic patients is two to three times higher than that of subjects without DM [1–4]. In addition, several previous studies have shown that post-load hyperglycemia such as impaired glucose tolerance (IGT) is a risk factor for CVD [5–7]. 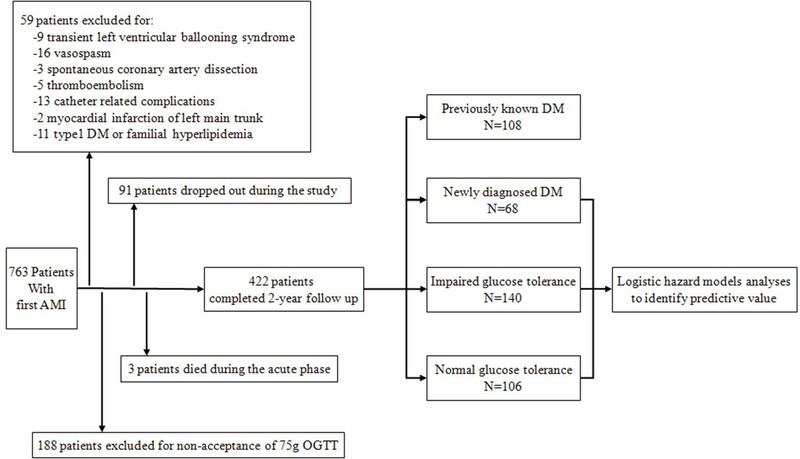 In patients with acute myocardial infarction (AMI), the prevalence of abnormal glucose tolerance (AGT) using an oral glucose tolerance test (OGTT) was >70% [8–11]. In the GAMI (Glucose Abnormalities in Patients with Myocardial Infarction) study and the report by Tamita et al, AGT including IGT and newly diagnosed DM (NDM) were strong predictors of major adverse cardiac events (MACE) after AMI [12, 13]. The risk for poor long-term prognosis after AMI may be already apparent if patients have post-load hyperglycemia even at plasma glucose level well below the diabetic threshold. The threshold for definition of DM is primarily based on a post-load two-hour (2 h) plasma glucose level in patients with diabetic retinopathy. Hence, cardiovascular disease has not been considered as a factor in the classification of glucose tolerance abnormality. In the current study, we performed a retrospective analysis of patients with AMI whose glucose tolerance were assessed by using a 75 g OGTT, and evaluated the relationship between their glucometabolic status and long-term MACE. We also determined the critical level of the 2 h post-load plasma glucose to predict the occurrence of MACE. Between January 2000 and December 2004, a total of 763 patients with first AMI were admitted to the National Cardiovascular Center (Osaka, Japan). Of the 763 patients admitted, 422 patients who received glucose tolerance tests or were previously known to have DM were evaluated for cardiac events for two years. The diagnosis of AMI was based on the presence of typical chest pain, ST-segment change or new Q-waves in the 12-lead electrocardiogram, an increase of ≥2-fold over the upper limit of normal in creatine kinase concentration, local asynergy of left ventricular wall on ultrasound cardiography or left ventriculography, or occlusion of coronary artery on coronary angiography. Patients with transient left ventricular ballooning syndrome, vasospasm, spontaneous coronary artery dissection, thromboembolism, catheter related complications, left main trunk infarction, type 1 diabetes mellitus or familial hyperlipidemia were excluded from the study. Glucose abnormalities of study patients were classified into 4 groups using a 75 g OGTT according to the criteria for glucometabolic disturbances established by the World Health Organization (WHO). This was because we first started to evaluate abnormal glucose tolerance using a 75 g OGTT in patients after AMI in year 2000 [14, 15]. Only 4 Patients with impaired fasting glucose tolerance were defined as IGT according to Japanese diabetes criteria. A 75 g OGTT was performed in the stable phase of AMI (median: 9 days from the onset of AMI). Previously known DM (PDM) patients were defined as those with clinical history of using oral hypoglycemic agents and/or insulin and patients with fasting plasma glucose levels ≥126 mg/dL. The other patients were urged to evaluate their glucose tolerance by a 75 g OGTT. NDM was defined as fasting glucose level <126 mg/dL and a 2 h post-load glucose level ≥200 mg/dL. Normal glucose tolerance (NGT) was defined as fasting glucose level <110 mg/dL and a 2 h post-load glucose level <140 mg/dL. In the remaining patients, IGT was defined as fasting glucose level <126 mg/dL and a 2 h post-load glucose level ≥140 mg/dL or with fasting glucose level of 110-125 mg/dL and a 2 h post-load glucose level <140 mg/dL. All patients who survived the acute phase (≤30 days) were followed-up at the outpatient clinic and their data for MACE were collected. Three patients with PDM died during the acute phase. In this study, a total of 422 patients were followed-up for two years. Patients' outcomes were assessed on the basis of MACE, which included death from cardiovascular causes, nonfatal AMI, hospitalization for heart failure and revascularization for restenosis and de novo lesions. Revascularization was performed after obtaining ischemic evidence by several modalities. To determine the predictors of long-term MACE, the baseline clinical characteristics of the patients including laboratory data, characteristics of AMI, and medications (Table 1) were evaluated using hospital records under the auspices of the institutional cardiovascular outcomes monitoring program. SPSS Software version 17.0 (Chicago, USA) was used for all statistical analyses. Continuous variables were expressed as mean ± standard deviation (SD). Statistical significance was evaluated using unpaired Student's t test for comparisons between two means, and a chi-square test for categorical data. Event-free survival curves were constructed using the Kaplan-Meier survival methods and were compared with log-rank statistics. Survival time was defined as the intervals between the onset of AMI and the time of MACE. Receiver-operating characteristic (ROC) analysis was performed to define sensitivity and specificity of 2 h post-load plasma glucose. In addition, ROC analysis was used as an exploratory evaluation of the best cut-off point of 2 h post-load plasma glucose to predict MACE after AMI in non-PDM patients and positive and negative predictive values were derived using this cut-off value. Logistic regression analysis was used to identify predictors of cardiac events. A p value of < 0.05 was considered statistically significant. Figure 1 shows a flow diagram for the enrollment of patients into this study. Of the total 763 patients, we excluded a total of 247 patients; 48 patients for etiology of AMI, 11 patients for clinical history of type1 DM and familial hyperlipidemia, and 188 patients who did not consent to have the 75 g OGTT. Three patients with PDM died during the acute phase (≤30 days) after AMI. In all, 422 patients completed two years of follow-up from onset; 91 patients dropped out during the study and did not complete the two years of follow up. The clinical characteristics of the patients who completed the study are shown in Table 1. The PDM group had a higher mean age, and a higher prevalence of co-morbidities and incidence of multi-vessel disease compared with the other groups. The NDM and PDM groups had higher body-mass index and serum triglyceride levels compared with the NGT and IGT groups. The level of HbA1c of the NDM group was significantly lower than that of the PDM group (5.7 ± 0.4 mg/dL vs. 8.1 ± 1.5 mg/dL, p <0.05). Only 2.9% of patients in the NDM group were being treated by oral hypoglycemic agents, while 61.1% and 16.7% of patients in the PDM group were being treated by oral hypoglycemic agents and insulin therapy, respectively. The prevalence of NGT, IGT, NDM, and PDM was 25%, 32%, 16%, and 26%, respectively. Of the 310 patients who were tested with 75 g OGTT, 204 patients (66%) showed post-load hyperglycemia of ≥140 mg/dL. Only 4 patients showed impaired fasting glucose tolerance with a fasting blood glucose level of 110 mg/dL to 126 mg/dL. Long-term MACE were observed in 120 patients. Table 2 shows the numbers of long-term MACE among study patients. There were 40 cardiovascular events in the PDM group, 24 events in the NDM group, 32 events in the IGT group, and 24 events in the NGT group. The 2-year cumulative event free rates from MACE were 63.0% for the PDM group, 64.7% for the NDM group, 77.1% for the IGT group, and 77.4% for the NGT group. Figure 2 shows Kaplan-Meier plots of study patients with MACE during the 2-year follow-up period. The PDM group and the NDM group showed significantly higher event rates than non-diabetic patients and the NDM group had a similar event rate to the PDM group. There was no significant difference in event free rate between the IGT group and the NGT group during the follow-up period. Kaplan-Meier curves showing event-free survival from MACE after AMI during the 2-year follow-up among the 4 groups. The clinical characteristics were compared between non-PDM patients with and without MACE (Table 3). There was no significant difference in long-term MACE rate between non-PDM patients with and without MACE although the 2 h post-load plasma glucose appeared to be related to the occurrence of MACE. Logistic analyses were carried out to examine an independent predictive value of the 2 h post-load plasma glucose level for long-term MACE. The adjusted variables were the 5 factors that were previously reported to be related to MACE: age, left ventricular ejection fraction, multi-vessel disease, use of beta-blockers, and statin use. The ROC analysis indicated that a cut-off value of 2 h post-load plasma glucose level ≥160 mg/dL best predicted MACE in non-PDM patients. This measure of post-load glucose value showed a sensitivity and specificity of 59% and 58%, respectively. The positive and negative predictive values of 2 h post-load plasma glucose level ≥160 mg/dL were 32% and 80%, respectively. The odds ratio of 2 h post-load plasma glucose values for MACE was 1.85 (95% CI: 1.07-3.21) for patients with glucose level ≥160 mg/dL. The logistic models analyses revealed that 2 h post-load plasma glucose values of ≥160 mg/dL was the only independent predictor of long-term MACE after AMI (p = 0.028, OR: 1.85, 95% CI: 1.07-3.21). 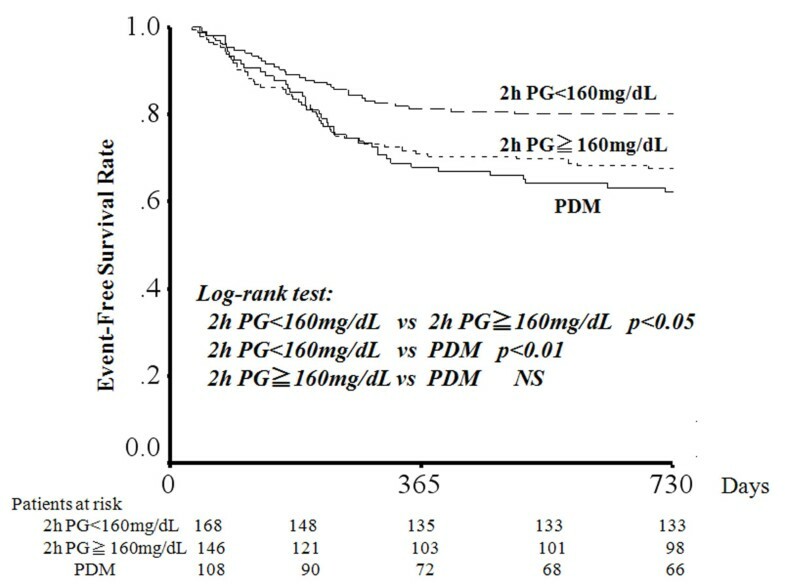 Event-free survival rate was also compared between patients with 2 h post-load plasma glucose ≥160 mg/dL vs. <160 mg/dL, and patients with 2 h post-load plasma glucose ≥160 mg/dL vs. PDM group. The 2-year event-free rate of patients with 2 h post-load plasma glucose ≥160 mg/dL was significantly higher than that of patients with post-load plasma glucose <160 mg/dL (67.8% vs. 80.2%, p <0.05) and was similar to that of PDM group (62.6%, p = 0.513) (Figure 3). Kaplan-Meier curves showing event-free survival from MACE after AMI among patients with 2 h post-load plasma glucose ≥160 mg/dL, with 2 h post-load plasma glucose <160 mg/dL, and with previously known DM. During the 2-year follow-up, the incidence of cardiovascular events after AMI was 37.0% in patients with PDM and 35.3% in patients with NDM. Both groups had similarly increased risk of long-term MACE after AMI and significantly higher incidence of MACE compared with non-diabetic patients including IGT patients. When baseline characteristics were compared between the NDM and PDM groups, the level of HbA1c of NDM group was significantly lower than that of PDM group (5.7 ± 0.4 mg/dL vs. 8.1 ± 1.5 mg/dL, p <0.05). These results indicate that patients with diabetes may have an increased risk of cardiovascular events after AMI irrespective of diabetic status such as severity or disease duration of DM. 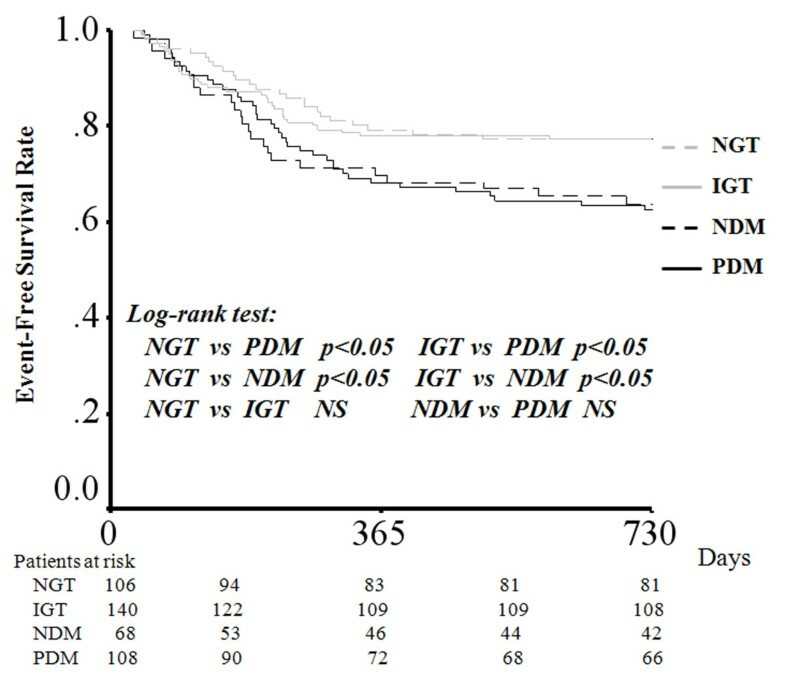 Therefore, early detection of NDM using a 75 g OGTT after AMI may be important in the risk assessment of cardiac events. Several previous epidemiological studies have indicated that even patients with pre-diabetic conditions, below the diabetic threshold, are at high risk of cardiovascular disease [5–7]. The GAMI study and a study by Tamita et al  showed that AGT including IGT and NDM was a risk factor of increased cardiac events after AMI [12, 13]. However, it is unclear whether patients with post-load hyperglycemia below the threshold for DM after AMI have a risk of long-term cardiovascular events. The Euro Heart Survey has reported that PDM or NDM, but not IGT, has a negative influence on the 1-year outcome in patients with coronary artery disease . In the current study, we similarly demonstrated that NDM is a factor for increased risk of cardiac events as is PDM after AMI, but there was no significant difference for long-term MACE between IGT and NGT patients. We demonstrated that patients with a 2 h post-load plasma glucose value ≥160 mg/dL, including patients with plasma glucose value consistent with DM, had a significantly higher risk of long-term MACE after AMI than the patients with post-load glucose value <160 mg/dL. Although we demonstrated NDM patients had an increased risk of cardiac events after AMI in the present study, we confirmed that patients with post-load hyperglycemia (≥160 mg/dL) had increased risk of poor long-term outcomes after AMI. Previous investigators have suggested several potential predictors for long-term cardiovascular events in patients with AMI, including impaired left ventricular function, residual ischemia, and pharmacological therapy [17–25]. Even after adjustment for previously proposed predictors and age, we found that a 2 h post-load plasma glucose level ≥160 mg/dL is another potential predictor of long-term cardiovascular events after AMI. The cut-off points for DM on fasting and 2 h post-load glucose values were primarily determined based on the prevalence of microvascular disease related to hyperglycemic complications like diabetic retinopathy. We may need to reconsider the thresholds used to diagnose post-load hyperglycemia for macrovascular disease or cardiac events after AMI. Previous studies have shown that elevated plasma glucose adversely affects endothelium-dependent vasodilation, inflammatory responses, and increases oxidative stress on the cardiovascular system [26–30]. These hyperglycemic stresses may appear below the threshold glucose level for DM and play an important role for promoting cardiovascular events after AMI. Fasting glucose and glycated haemoglobin provide no information on glucose metabolism after glucose load. It is important to use an OGTT to evaluate glucose tolerance among patients with AMI [31, 32]. Because we demonstrated that patients with a glucose value ≥160 mg/dL had a high risk of long-term MACE, similar to the PDM group, early detection of post-load hyperglycemia of ≥160 mg/dL using an OGTT may be useful in the risk management of patients with AMI. In addition, adjunctive therapy for these patients may improve long-term cardiac events after AMI. Further study is needed to confirm this observation. In the current study, 74% of the study patients showed abnormal glucose tolerance (32% for IGT, 16% for NDM, 26% for PDM). Recent studies have shown that NDM and IGT are common among patients with coronary artery disease including acute coronary syndrome [8–11, 33, 34]. According to the European registry, when patients with AMI, but without PDM, were challenged with an OGTT, about 65% showed abnormal glucose regulation . We found that 74% of study patients had abnormal glucose tolerance, which was similar to the 65% reported previously . Although several previous studies have confirmed that post-load hyperglycemia or impaired fasting glucose increases cardiovascular disease morbidity and mortality [35–37], it is still unknown whether lifestyle modification and medication for hyperglycemia would reduce this risk. However, in the report from the Euro Heart Survey on Diabetes and the Heart , it has been noted that lowering blood glucose using metformin may reduce the risk of cardiovascular events among patients with DM. According to the PROACTIVE Study , pioglitazone significantly reduced the occurrence of cardiovascular events in patients with DM who have a high risk of macrovascular events. Recently, preliminary data have shown that there was a pronounced decrease in cardiovascular events in patients with NDM prescribed glucose-lowering drugs compared with those not receiving such treatment . On the other hand, it has not been ascertained that for patients with IGT such interventions also reduce the risk of cardiovascular events. The STOP-NIDDM study  showed that the rate of cardiovascular events was significantly reduced in the patients with IGT who received acarbose compared with placebo. In a further study, we have to address the issue of whether the control of post-load hyperglycemia would reduce the risk of recurrence of cardiovascular events after AMI. This study was a nonrandomized retrospective analysis based on a small number of patients in a single center. Therefore, our results may not reflect the real world population. Second, we excluded from the study 188 patients (25%) who did not consent to have the 75 g OGTT. Enrolling more patients who consent to having the 75 g OGTT might make the results more convincing. In this study, we evaluated glucose tolerance of study patients at only two time points, fasting and 2 h post-load, using a 75 g OGTT. Estimating of post-load hyperglycemia and parameters such as plasma insulin level could better clarify the relationship of post-load hyperglycemia and cardiovascular events after AMI . Large randomized prospective clinical trials are needed to support our conclusions. NDM increases the risk of MACE after AMI as does PDM. NDM and PDM patients have a similar poor prognosis for MACE after AMI. Particularly, post-AMI patients with a 2 h post-load hyperglycemia ≥160 mg/dL may need adjunctive therapy after AMI. Shuichi Kitada, Yoritaka Otsuka contributed equally to this work. We would like to thank Mrs Hiromi Maeda for her excellent secretarial assistance, and the nurses and residents in the coronary care unit of the National Cardiovascular Center for their cooperation. SK has made substantial contributions to acquisition, analysis and interpretation of data, and has been involved in drafting the manuscript. YO has made substantial contributions to conception and design and has been involved in revising the manuscript critically for important intellectual content. NK, YK, YK, TN, YG, GK and HN have been involved in revising the manuscript critically for important intellectual content. All authors have given final approval of the version to be published.